I’m out here flailing my hands. I revise WAY more than I write. I can’t count the number of revisions I make to a piece of writing. Using a first draft would be like walking into a crowded room naked! I see from my Documents folder that I am on about the twentieth named draft of both my current novel and my non-fiction work – and that is not counting all the revisions within each document. It may be possible to overdo the revision process. I think Book One went through 8 re-writes, 3 drafts and 2 character changes, seven years of groaning and lots of teeth gnashing. Write on! I wish you all the luck in the world. Really I do. One of the ways that I know that I have grown as a writer is the ability to revise… That said, the novel has been pushed to the very bottom of the to-do list because writing it took over a year and re-writing gets hairy… Maybe you have motivated me to move it higher on the list. Thanks for making a very good point. If you have trouble finding time for your book, try allocating it a specific time-frame, like just before you go to bed, or while you’re eating lunch. Even if it’s only a few minutes a day, any progress at all is better than no progress, and progress gets things done. Writing is fluid, meaning it is always changing it’s flow, it’s form. 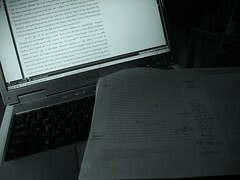 Revising, proofing, editing will change the overall piece, so essentially we are writing multiple drafts. I can return to a published piece and still find ways to revise it. I don’t know if writing can be truly ever completed. We must simply reach a point of satisfaction. I don’t really think there’s such a thing as too much revision on a novel. Each time gets better and better until you get to a point where you’re just changing instead of improving. When you feel you’ve gotten to that point, publish. Also, you’re writing for you, so of you’re not happy with it, it needs more work, no matter what anyone else thinks. I agree: there are times when you look back on a section in a story you were really proud of in the first draft; and it’s really obvious, it’s a piece of ….